Roasted Quinoa Stuffed Pears are exactly what I want to eat on a cool morning this fall. 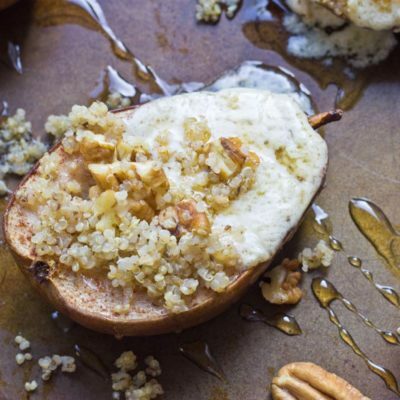 These pears are stuffed with mascarpone cheese, quinoa, and pecans. So yum! Cut pears in half lengthwise; spoon out seeds and core. Slice piece of skin off on underneath to give the pear a flat surface to lay on. Coat the pears with coconut oil and place skin side down. Sprinkle pears with a dusting of cinnamon and bake in the oven for 25-35 minutes (depending on how firm your pears are) until fork tender and golden brown. In a small bowl, stir together mascarpone cheese and vanilla extract. In separate bowl, toss together quinoa, flax, apple cider vinegar and pecans. When pears have finished baking, top each with spoonful of quinoa, mascarpone cheese, and a drizzle of Truvia Nectar.